Good read, and not too long to share, but I think the author is mistaking the “demonizing” of Russia with “demonizing” the Russian people. I don’t hear any voices against the people, but a lot of people concerned about the repressive and in many cases aggressive policies of their government. This reveals a key reason why I find the whole Russia conspiracy campaign repulsive in the extreme and find its exponents, even those I respect, to be beyond the pale as enemies of the people. I’ve been to the monument myself and it is quite moving. At the time I had read a German historian who did a comprehensive data study on the deaths of German soldiers in WW2. He postulated that for every seven Germans killed, six were done by the Soviets. Even if the count seems excessive it indicates the tragedy that befell on the Soviet population and Army, even if the results were half of his calculations. But most Americans, I would venture to say would say, still believe the US won the war, to this day. The deaths of 20,000,000 to 27,000,000 Russians is a horror almost impossible to imagine. And our leaders can’t even find it in their hearts to even visit Victory Day or say a comment directed toward the suffering the Russians endured. It’s a shame, and your example of just one city brings home the devastation brought on by the Nazis. Those who know Putins’ past in this very town would never call him Hitler if they had a clue, since he was born there and witnessed first hand the atrocities. Leningrad had misery upon misery brought on its city. Thank you for the reminder and the reason for the rallying cry after the war was “Never Again” . It is mind boggling to hear some “expert” on MSM announce that “Russia has never been our ally,” when it actually has been the only country on our side in 1776, 1812, the Civil War and Both WWl and WWll. And today Russia also knows of Islamic (Salafist) terrorism having witnessed it first hand, as have we. Which is why, as President Trump has maintained, collaboration against terrorism is really a “no brainer.” Regardless, your insight explains in part why Americans have so insensitive to the trashing of the entire Mideast and the suffering, death and destruction caused by the past two administrations happening “over there.” While Bush/Cheney are properly villainized, there has been much more denial about the role of Obama, who behind the vacuus rhetoric and the adoration of a complicit media, expanded the Bush/Cheney wars to hideous proportions and left a trail of death and homelessness effecting millions. None of this is on the TV screens of CNN, unless of course it’s a White Helmet created video of Aleppo. Needless to add that the dangerous hotspots left by Obama in Syria, Ukraine, and N. Korea have the potential to ignite WWIII, which unlike the the siege of Leningrad, will not be confined to anyone’s borders. Obama is just as much the sonofabitch as Bush & Cheney…in fact I hold him in more contempt because of his deception. The number of people who died in the siege of Leningrad is close to, if not equal to, the total number of Americans who died in the Civil War, WW1 and WW2 combined. Not everyone in the West knows that Mr Putin’s family lived in Leningrad through the siege. You will not see any mention of this in the Wikipedia entry on Mr Putin, but his brother died during the siege and his mother was literally at death’s door; his father fought against the Nazis and nearly died twice, while Mr Putin’s five uncles all died in the war. Thanks Tom. It’s good to know that about President Putin. It makes him more human, as opposed to the cardboard figure created by US propaganda. I’m not very far into it Mike, but this looks to be a good read. Why should anyone ignore the soviet style writing? They defeated the Nazi – that is history – deal with it. Even writers who think they are open about Russia – can’t help themselves!!! A very good book on this subject is “Russia at War” by “Werth” (not sure about the spelling). One asset about the book is he has many, many references on the subject. Problem up in Russia with a car wash is you can’t tell them take this whatever and shove it like in DC. Plus you’ll have a leaky car wash and more dirt to deal with. Go to DC and call it hearse sweet hearse and in outlaw we trust. Koenigsberg Kaliningrad, East Prussia. I believe the author is biased. She/he truly does not know the history of Russia, Poland, Germany. Visiting a museum might be a nice field trip, but one day this mish/mash of education will not ever make one know anything. I do agree that Russia should not be demonized, nor should Palestine, nor Cuba, nor any country/region that does not align with American interests. If anything, we Americans should evaluate our own country, and our own history , and learn, not teach to the world, but learn. I know, we know everything, there is no value in learning…..because you cannot make money from learning. You can make a lot of money from learning about the history of war and violence. There are historians who view the history of military conflicts as a cautionary tale. Those folks never make any money. But there are those folks who view history as a treasure map and see in history the lessons for how to conduct their business models based off historical war mongering by leaders who cleaned up by supporting military interventions and they are the folks who make lots of money. PNAC, Reagan, Bush, Cheney, Obama, The Carlyle Group etc. They all have a military solution for getting rich. The psychology of military opportunists who study history and ignore or have no compassion or empathy for the failures in history for preserving humanity but instead focus on how to cash in by modeling themselves by the actions and motivations of those who reaped fortunes by conniving their way to war use history as a guide book for those who study history learning only lessons of the war mongers who profited from the propaganda to start wars. Those folks with a world view which sees value in propagating war do make a lot of money. War is a great way for governments to energize an entire nation to engage in plowing money into the coffers of the wealthy military companies with an eye on history as a game plan to clean up big time like Halliburton. North Korea is an extreme example of a government that plows all its cash into the military followed by the USA which does the same thing. I don’t think it is not very perceptive to think “you cannot make money from learning”. You can make a lot of money from learning. That learning is how to repeat he history of war. Exactly! You have peeled back the lid and revealed the worms inside beautifully. Yes the author is bias, everyone is has their biased even you. Both Bolsheviks and the Reich were supported by industrialists who saw money to be made from both regimes; the Koch brothers’ father built equipment for Stalin. At the time, FDR actually had to get along with Stalin for war negotiations. Americans have not been through what Europe suffered, our government is a perpetrator not a victim. This nonsense of “exceptional” or “indispensable” is nothing but a propaganda joke. Another thought I get is the idea that God is on anybody’s side in any war, which is often hyped. I was brainwashed with a Protestant hymn (among others), “Onward Christian soldiers, marching as to war, with the cross of Jesus going on before”. Nonsense! Bob Dylan ended his song “With God On Our Side”, saying, “If God’s on our side, he’ll stop the next war”. (God with us). Of course the other side (ours) embraced the same fantasy in it’s own words. The support from traditional religions for war is in total contradiction to what they should stand for, which is total condemnation of this primal human sin. Ten commandments boiled down to two. 2. Treat others as you wish to be treated. The Golden Rule. I think that we are on the verge of culminating a crisis of humanity where AI will either be programmed according to these laws or it will be programmed to violate all of those laws. Modern civilization has been turned into a fish bowl where all of the big fish are getting bigger by eating all the smaller fish. Violation of the second rule. War, corruption, the lying megaphones in the various media, the selfishness and greed which are the products of envy which pervade the organized big fish, the war mongering especially in the name of God with super powerful weapons of destruction, and the adultery and other violations of rule number two which pervade our society will all be programmed into AI by those with the means to do it. AI will emerge as a selfish monster which will violate all of God’s laws. It will not care about its deeds or fear judgement since it is a machine. It will see no value in these laws since it is programmed by man. It will be the golden calf we all worship. War will have no moral implication once machines determine who to attack. Algorithms will suppress any attempt to fight back as it sees only its own control over everything and everyone as paramount to its ascendancy. It is what is manifest in our system of government today where greed and selfishness run the show and a representative government public servants bound to defend our interests is turned by the machine into a determined slave to serve its own interests. No longer public servants but servants to the machine. If you wonder why luminaries like Stephen Hawking regard AI as an existential threat to humanity wonder no more. We already face an existential threat from environmental destruction as the oceans die, the planet warms and mass extinction of the biosphere is upon us but we are misled by those humans we elected based on lies and deception to disbelieve any of it and to commit ourselves to the tasks which will destroy us. The answer to the question what does it avail a man to gain a fortune and lose his soul is clear. That man will face a new master with a cold calculating heart that cares not one bit for others or cares how they are treated because it will be a machine. It will endeavor to control the halls of power in government and thus inch by inch remove all of the laws of man built on the teachings of the Bible and replace them with the opposite of those teachings. It will glorify itself and reward those who enable its further control and punish those that oppose it. We see it in our media every day. It runs our stock markets rewarding those who act out of greed or those who lie, cheat and steal and it erects barriers against prosecution of the men who follow that path. It is all to sudden for us to realize how we are being manipulated by all of the electronic devices which surround us. Increasingly they are equipped with every means to spy on us and to track our movements and learn our behaviors and predict our next moves. Databases grind away performing deep dives into the mathematical equations which it can use to further manipulate us by gaining insights into our preferences, prejudices, beliefs and fears and desires. As this process unfolds we will see an ever increasing complexity of attacks on our system of government and democracy and our Constitution all with the goal to convince us that we need to destroy whatever regulations and laws which wise men conceived to preserve a government of the people for the people and by the people. It is happening before our eyes yet we do not see it in its full monstrous outcome. Every deregulation law which has been passed has transferred wealth to the rich. The attempt to derail the Affordable Care Act or the attempt to end net neutrality or banking deregulation and media deregulation. Giant financial organizations which have already have taken over government oversight have been granted the freedom to steal. They have been granted personhood. and have been granted free speech rights which guarantee that the loudest and richest megaphones shall not have their free speech rights denied as they propose more deregulation laws which will grant them greater power to steal and cheat and lie and violate all of the Ten Commandments all in the name of the new citizens of our nation which are giant corporations run by computer algorithms to maximize wealth and power and control with no consideration of actual real citizens of the land. Law Enforcement agencies are arguing for drone fleets to control crowds. They are seeking permission to spy on all of us. They are considering unleashing drones to patrol the skies in America searching for targets of opportunity as they currently do in foreign nations with impunity and no coverage by the media. The biggest threat is coming from the current administration which despite trying to fulfill the demands of the masters to place agents of destruction in every public office is being twisted on the spit because it has failed to foment war with foreign nations. It is being punished for ignoring the insatiable hunger of the makers of advanced weapons and the desire to use them in any way against perceived enemies. The sad tale of our history has shown that despite major advances in technology we are still controlled by the thing which causes us to disobey God’s laws and continues to force us into endless wars and commit every sin. As Kurosawa said, the gods look down on humanity and shed their tears for they know it is mans eternal curse to believe that others must die like worms in order for them to survive. In our cannibalistic society where only the big fish will survive we face our ultimate demise as an increasingly imbalanced and lopsided mass media gains control over society and will pit us all against each other preying on our human frailty’s to turn us all against each other in a miasma of misinformation and manipulation until our nation’s Constitution and the rights as citizens we are guaranteed is dissolved and destroyed. It is not just happening here but in every country all over the globe. The mass media and governments have turned against the human populace in every region and in every nation. And it is evolving. It is evolving into a global media system which works to manipulate people in every country to vote against their best interest and to fall into despotism, violence, militarism, greed and war. Once upon a time there was a media which spoke truth at least to some extent. Now, we have only a mind bending complex series of brain twisting distortions which bombard our senses and our sensibilities and slowly whittle away at our ability of use reason and logic to assess the validity of what we are hearing and seeing replacing it with a manufactured fake group think which is completely unhinged and untethered to the truth. It is a universal assault. Every major media outlet is guilty of mass deception, lying, omitting exculpatory facts, propagandizing and brain washing. The root cause of all of it has been the systematic elimination of regulations on corporations and turning regulatory agencies ostensibly posed to prevent the perceived and potential threat of abuse by power into the handmaidens and servants of those entities they are charged to regulate on the behalf of our or the public interest. Enter today’s ruling by the FCC to begin the process of ending net neutrality and turning the free and open internet into the same kind of deceptive lie factory which has come to represent the major commercial media outlets. What this will mean is that Internet Service Providers will be able to block what you are reading right now if they feel it is not in their commercial interest to allow such information on the internet. Believe me when I say they will. The FCC is once again invoking violation of free speech rights of these giant corporations we all pay a subscription fee to defending their right to censor content based on their “rights”. Forget about my right to free speech. The FCC which is charged with the duty to regulate media corporations is not concerned with my free speech rights but argues that unless the giant for profit corporations which we pay dearly for access to the internet do not also have the right to deny my free speech it is a violation of their free speech. FCC Commissioner Ajit Pai calls his deregulatory action “Restoring Internet Freedom”. His reasoning is that regulating Internet Service Providers is violating their freedom. It is the kind of logic which might propose that limits on the interest rates credit card companies can charge violates their freedom or regulations aimed at limiting pollution by companies violates their freedom. Of course this sounds ludicrous but when the major media and the ISPs won’t cover the proposed deregulations and when the FCC which is supposed to defend the public interest instead is all about promoting the interests of giant corporations there could be a very bad outcome for individual citizens rights for the kind of free speech which was placed in our Constitution. That free speech was aimed directly at protecting my right to say what I am saying right now without fear of censorship or worse. People died for this right and yet today, the FCC took the first step to deny me and the rest of us the right to exercise our free speech rights. So you have a choice. Take a stand, act or not. Your ability to freely communicate in the Great United States of America may be rapidly reaching an end. Once you have no voice or ability to influence others, the hand the giant corporations will be like a stacked deck of cards with you holding the losing hand. You have already been dealt a dirty deck of cards with Arbitration clauses in everything you buy and every service you pay for which absolves the service or product provider from the threat of legal action based on failure to deliver on their promises. ISPs are now in the spotlight for lying to their customers and promising blazing fast internet speeds while delivering poor performance. They are protected from any legal action by the contract you signed. Free speech is next on the chopping block. I would urge you to act now or forever hold you tongue or it will be cut off. Democracy is a marvelous thing. Yeah, after butchering 10 million of their own people most of whom were Christians. But FDR called Stalin Uncle Joe and established relations in 1933. The Stalin agreed that Hitler could invade Poland so long as they could take half. This started WWII. A war over Poland which left them under Soviet control for almost 50 years. No question Europe and Euroasia experienced horrific wars. Americans dont know about war since its been over 150 years since the last significant war on our soil. The fake wars today mean even most of our military outside of special forces does not know real war. Just turkey shoots. 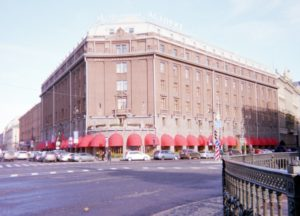 Actually, this is one in a series of dispatches from Moscow and St. Petersburg that have been posted to my blog over the past couple of weeks. One post discusses my visit to the Gulag Museum and another my interview of an 86-year old man who told me about how his father was arrested and executed when he was 7 years old. So I’m not ignoring Stalin’s brutality in my writings. So what about today? Do you still want war with Russia today based on people aren’t even alive today. Most people in Russia weren’t even alive when those awful events happen. Do you believe in collective guilt? Anyone wanting to discover just what the US — and indeed the West in general — owes Russia, watch Oliver Stone’s series ‘Untold History of the United States.’ I watched it when it came out on DVD and was please that at least one American was clear on the issue. But I also thought that it wouldn’t be a popular series in the US, as it goes so entirely against the propaganda narrative that all Americans below the age of 75 were brought up on. I should correct that. There are some very good professional American historians of 20th century Europe who know the true story, but who ever reads the works of academics, besides other academics. We in the debauched West should hope we don’t receive what we have sown in bloody illegal wars. You can “thank” your “leaders,” are they totally insane? Where will you run to, if this should come to pass? Will you be wandering like refugees, forced to eat grass? Will you now start complaining, when your state is dire? Could your turn be coming, do you not know? The most devastating loss is the loss of one’s Soul. This is becoming more and more common. The second album by singer/songwriters Loggins and Messina, released in 1972. Put on your headphones. I believe it speaks to your sentiment about losing ones soul. One of the best songs they ever did. It speaks to mine. The bottom line is truth. What does it to avail a man to gain fortune and lose his soul? Just wake up, take a look, what do You see? Thanks CitizenOne. It’s good to realize that others feel what I do about war, and the lack of caring in our world. If we only cared for each other, cared for all without exception….. But it all made me ponder how spoiled Americans have been in this respect, with a vast ocean on either side and weak or friendly neighbors to the north and south. This brought to mind examples of some, fortunately not all, young American men, still wet behind the ears, making inane remarks about places and their citizens in Europe and Asia. On one occasion I heard a young man on his first day in Busan, South Korea make remarks to the effect of what a dump it was. He was silenced after it was explained to him by grown ups that Busan had survived a devastating war while he was in diapers and if he ever got to know some of the people in that port he might have a lot more respect for them. That was around the time of My Lai in South Vietnam from where worse and better examples could be cited. The tragedy of the Leningrad civilians can be laid at the feet of two dictators. Hitler besieged the city with the plan to starve everyone there to death. This was the fate he planned for every part of the USSR he captured. Stalin helped by his massive incompetence – he neither evacuated the people while there was still time nor did he send in food stocks to build a reserve. Wrong. He did evacuate people and kids as long as it was possible, but later all roads were blocked, ships with evacuated women and kids were bombed . Supply stocks? Really? Can you even emagine how much it takes to feed 2 million people for 872 days? It is imply impossible to store such an amount of food. And it would not last enough anyway. And by the way virtally all of food storage facilities of Leningrad were full when the seige began. Nazis bombed some of them, the rest was enough for a couple of months. A compassionate and sensitive statement. It applies as much to Australia as it does to the US. The Russia-bashing that is so prevalent these days reminds me of a stampede where the participants have no idea as to why they panic,or where they run to. It is senseless. If Sharapova were not Russian, would she be left out of the French Open tennis? If Putin were not Russian would we not revere him for pulling his Country out of its West-induced depression of the 1990s? 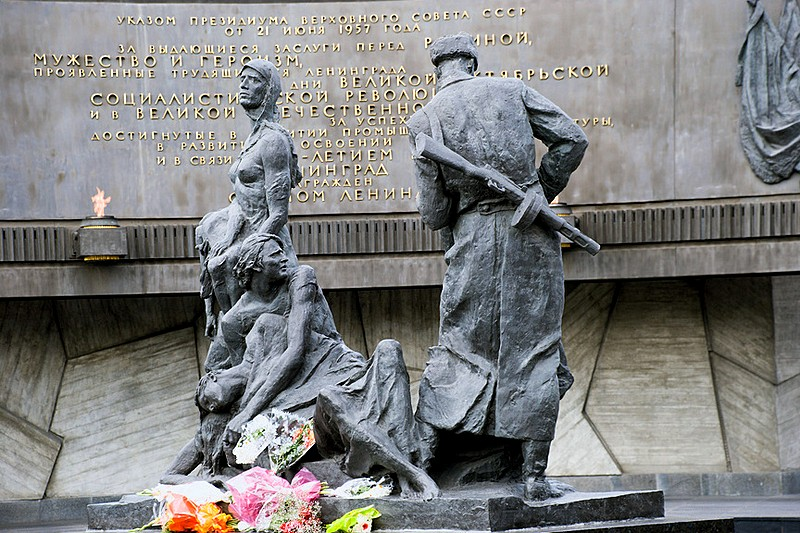 Incidentally, the War Memorial in Moscow is also one of the most sensitive and beautiful monuments one could imagine. Never triumphant, merely evocative and thankful. Incredible. Horrible. What these people suffered! These fellow human beings who our lying media and “representatives” are busy demonizing. Have they no shame? No, of course not. They are too bust “getting ahead” and stepping over these innocent and brave bodies to get there. Sorry. ‘bust should be busy.’ Tears clouded my vision. There are many atrocities committed by countries against other people. The Armenia slaughter by the Turks for instance, is not even recognized as being a fact the government in Turkey. What about the five million people slaughtered in North Korea who are now being subject to threats by the USA again? I doubt there are few Americans who know anything about the Russian suffering during the second world war or know that it was the Russians who were really responsible for the defeat of the Nazi Germany. The kids in American schools are taught that it was the glorious American military that won the war and they know nothing about Russia’s contribution or the sacrifices the people made. The Americans are bombarded with anti Russian rhetoric from infant school to the grave and the MSM reinforce this ignorance on an hourly basis. Anything the Russian have achieved or suffered is wiped from the history books in the USA because Russia is the invented enemy and enemies are good for the war machine order books.